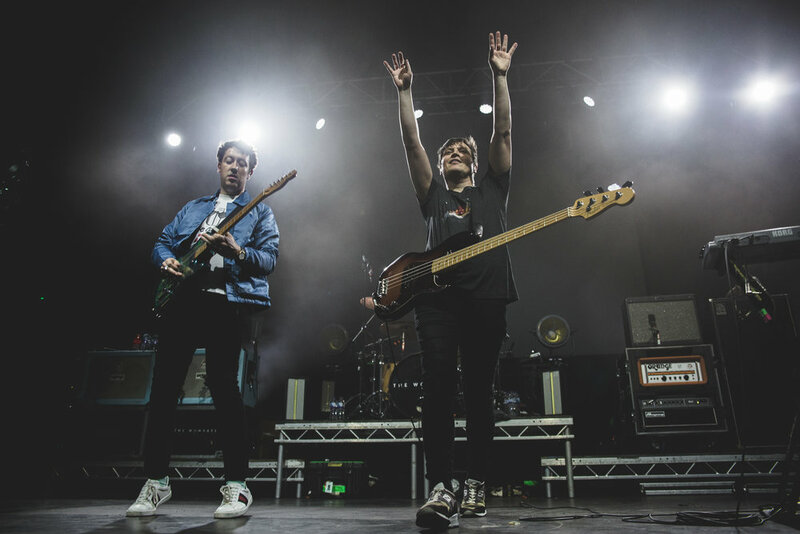 The Wombats, a band known for their belt-it-out pop anthems, struck Glasgow with two performances on back to back nights and appeared energetic and excited but are fans getting sick of their generously enjoyed hits? The Wombats were thrust into success in 2007 when debut ‘A Guide to Love, Loss and Desperation’ began to surface. This album contains the tracks that are synonymous with their name and indie-pop charted well. 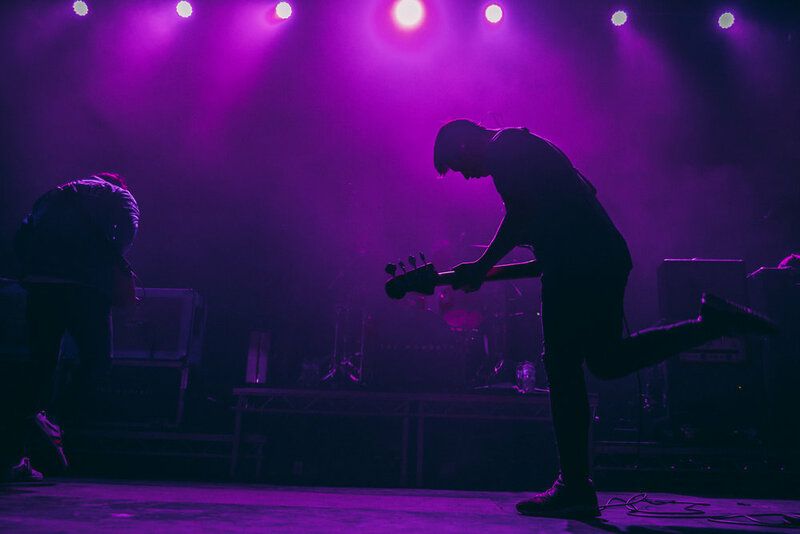 In the spirit of somewhat similar bands making their name at the time, like Kaiser Chiefs and The Pigeon Detectives, the lads’ tracks contained many hooks that listeners couldn’t help enjoy and connect to. They mixed a sense of frustration with upbeat, ‘F*** it’ feeling; a perfect mix for youthful and youthful –at-heart fans alike. The band’s follow up to this smash release was the less successful ‘This Modern Glitch’ in 2011. Singles from this did not chart well and the style of the album started to vary significantly from their previous. Their new sound had a lot more emphasis of the synth and even contained a techno-speed beat that contrasted greatly to the hard edge of what had been heard before. This new direction stuck with the band and they put out their next work in 2015, ‘Glitterbug.’ This album was critically successful and was popular among a fan base that was altering to the one originally building up at the group’s beginning. Their newest album ironically is called ‘Beautiful People Will Ruin Your Life’ yet they brought in a mostly young, hip looking crowd of image orientated beauties and it’s these fans, who can sing every word and catch every beat, that in fact caused the success in the life of the band. This album came out in early 2018 and displays there movement completely away from the harshness of their earlier, more indie style. 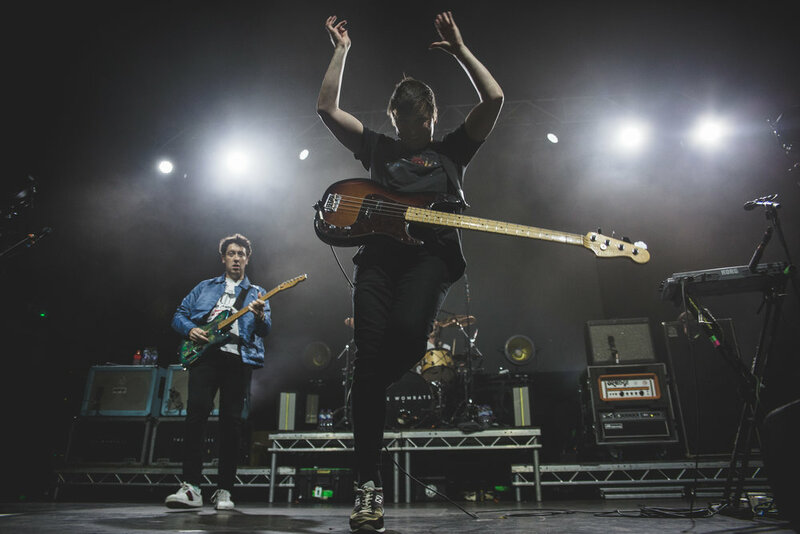 At Glasgow’s O2, The Wombats were supported by English rockers Blaenavon. They had a big fan following in the audience. Their sound is haunting and beautiful yet hard and intense. As performers they put so much in to their presence on stage and play every song like it was their finale. They are talented, mysterious and transfixing. They are a modern, poetic twist on rock music that, on stage, keep an aggressive passion intact. Particularly incredible were the lads unbelievably flawless, but seemly reckless, treatment of their instruments and, of course, Ben Gregory’s amazing trousers. The stage is then set of the night’s main act. The Wombats have a synchronised video for each track on a screen behind them. Edgy pop track ‘Cheetah tongue starts up and the crowd are elated. Vocalist Matthew Murphy is has a strong voice and is bouncy and bright all night. But the real star of the stage is bassist Tord Øverland Knudsen. He has an amazing ability to seemly running about the stage while at the same time playing perfectly; all the while a huge cheeser spread across his face. The crowd go mad for the band’s classic sound. ‘Moving to New York,’ ‘Kill the Director’ and ‘Let’s Dance to Joy Division’ sounded just as amazing as did 10 plus years ago. The band’s quirky pop numbers are performed energetically and joyously. ‘Jump into the Fog’ and ‘Emoticons,’ got a wonderful reception as did the epic ‘You’re Body is a Weapon’ which was belted by the crowd in all directions. 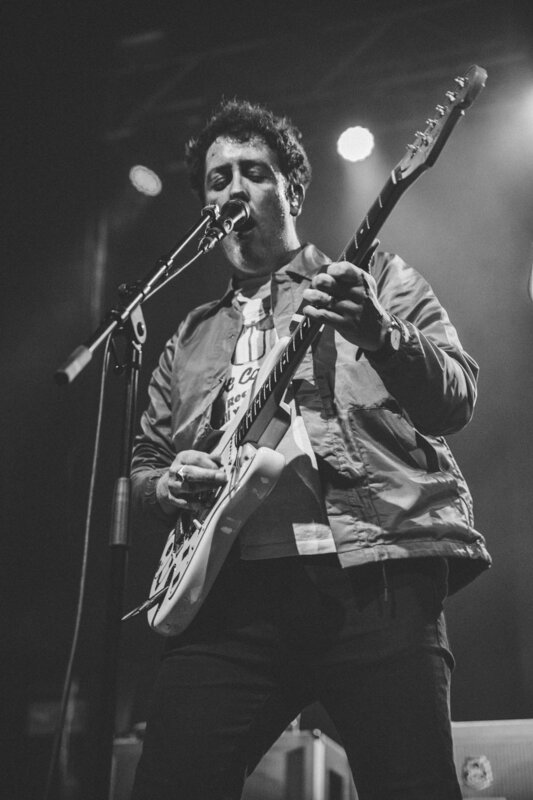 The Wombats have put a lot of effort in the impact of the show on the crowd through the use of the song specific videos and their inclusion of huge balloons dropping to in the fans and cutesy costumed dancers. It’s all too a bit too half-assed kitsch here but has the desired effect on the crowd by causing masses of extra excitement. The band’s encore is wonderful. With it all happening on and off stage, they play ‘Turn’ and finish on ‘Greek Tragedy.’ Murphey’s face red from effort and Knudsen looking surprisingly unaffected by his high level of exertion. The Scottish fans regularly chanted their delight at them and their band’s effort was greatly appreciated. They could leave proud of the two night run in Glasgow. 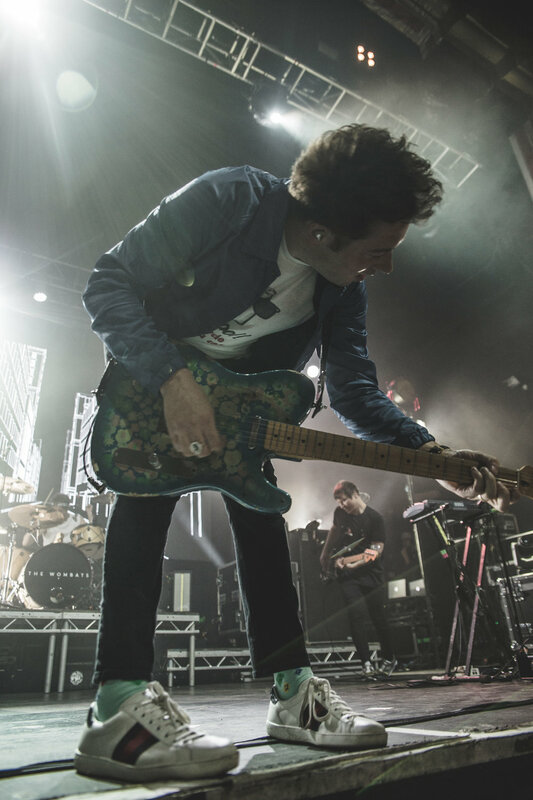 The Wombats will not disappoint at a live show. But it might not be the most surprising either. As they evolved, they mastered the sound of their old work and can perform it brilliantly. However, the impact wasn’t too different to hearing their albums played on incredibly expensive speakers.